Old Cakes Can Learn New Tricks…. Do you ever get the urge to cook, or bake, something that you have never eaten, and never really cared to eat, just because it is popular, because you like how it looks? I have that happen some times, and yesterday was one of those times. I had a can of leftover pineapple tidbits sitting in the fridge that I had saved from a meal a few days ago and I was trying to figure out what to do with them. Pineapple smoothies, and pineapple on pizza, are all played out and for some reason Pineapple Upside Down Cake came into my head. I’ve never tried it, my mom only made it once or twice, but it is a recipe that has been around for a really long time so I knew that there had to be something to it. 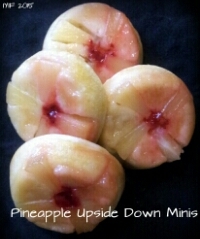 After looking up the definition of a Pineapple Upside Down Cake I figured that it sounded easy enough and I really couldn’t go wrong, but of course I had to change it, and while I was at it I thought that mini cakes would be even better! I’m sure you have noticed by now that I like mini everything when it comes to food. 🙂 I prefer them for a couple of reasons. First I like mini desserts because it helps with portion control. Second because they are just plain cute, and third it is kind of a mind game so for those counting calories you feel like you are getting more if you get two small portions instead of one large. This particular recipe you get TWO minis for half the calories of one piece of the original cake. Not too shabby! I decided to take the cake mix portion of my Cinnamon Roll Pound Cake recipe, ditch the nutmeg, add a little extra vanilla, and use that as the batter. I chose light butter and a little bit of brown sugar for the base of the cakes and used pineapple tidbits instead of pineapple rings, that would have never worked! I don’t keep maraschino cherries in the house because they wouldn’t last long. They are so good, but those guys pack a lot of sugar. 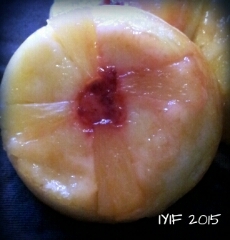 Instead of the cherries I decided to just use a little bit of reduced sugar strawberry jam in the center of each “pineapple sunshine” and it worked out perfectly! I carefully poured the batter over the top and they were ready for the oven. No muss, no fuss. Once they had cooled for a couple of minutes I placed a cooling rack over the top and flipped them over, I didn’t want to take the risk of them continuing to cook. I tried them after they cooled and thought “These are pretty good”. I read a lot of other bakers mention that this type of cake is best when it is fresh, but gets soggy as it sits. I was a little disappointed because if they were just ok fresh, then I assumed they wouldn’t be very good later. I was wrong! Later in the evening I tried another one, the brown sugar and pineapple juices had created a type of glaze over the top leaving the top yummy sweet and the bottom of the cake still nice and firm. But the true test came this afternoon. There was one left and I had to see how it held up. Even better! Now I know why this type of cake has been around for so long, or maybe it was just the magic of the minis! They look so adorable and yummy:) Minis are such a great idea for this cake! Howdy, I found your blog through Blogging 101, very nice work!